The backbone of our business is a Baker 3638D Blue Streak band sawmill. The mill is stationary. Our kiln is a L200 Nyle dehumidification kiln. It can dry 4000 board feet of lumber at a time. The dehumidification process is very controllable. Numerous internal probes in the stack assure accurate results. Our planer is a 24″ Oliver ITCH head. The helical carbide head does an excellent job on even the most highly figured lumber. The heavy lifting is left to our Hough H30 wheel loader. It also brings in logs and keeps our roads clear of snow in the winter. A Waldon 5000 wheel loader is the handiest machine in the yard. 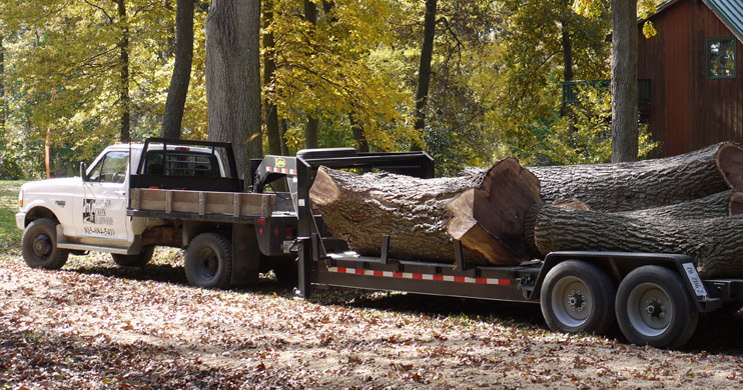 Along with handling logs at home, it fits on the trailer to load logs off site. For over-the-road hauling, we use a one ton Ford diesel and gooseneck trailer. A 1969 M274 A5 military mule is our choice over the usual four wheeler. It can carry a ton, has four wheel steer, and all four wheels turn all the time. It is rated for 60º slopes.